Related links to "Aesahaetter - s/t LP"
We’re glad to introduce this unholy project coming from the frostbitten lands of Canada. 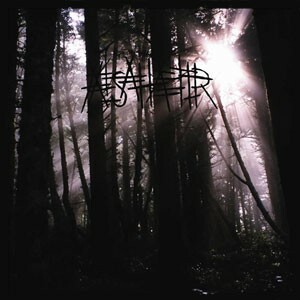 Formed in 2008 by sole member Mike Kirkenbrannsar, Æsahættr’s only recording effort to date was accomplished over two consecutive Winters, using the isolation and beauty of the harsh Canadian season to influence and shape the ultimate realization of the Æsahættr sound. Lyrically, this effort is largely based around the trilogy of novels His Dark Materials by Phillip Pullman, touching on the themes of Gnosticism, Atheism, and blacksmithing polar bears prevalent throughout the books. Cold, dark, epic black metal combining the rawness of Ulver’s Nattens Madrigal with some crusty changes of rhythm and atmospheric moments too. Æsahættr’s music will sweep your dark thoughts away & hide them in a cave to chew on your bones. The vocals are living demons, swirling around in a black hole spitting out pure bloodlust. These shrill screams of beautiful agony will have you under their spell. Musically, Æsahættr constructs songs that take the form of endless sonic diseases that someday will infect the whole world so that humanity as we know it will exist no more. While chaos & mayhem can be found in the songs that this band manifests, it’s the rivers of slow-moving sorrow that wash over you before allowing you to fly away and greet emotions that you did not know existed in your noir heart. I’m so into the way the Æsahættr builds on layers of tension to actually create serenity… I have seen the majesty of the nordic wilderness & thought to myself, what battles happened on this hallowed ground? While listening to Æsahættr, I can visualize those exact thoughts again… In order to perform live Æsahættr will be collaborating with the members of Thantifaxath, mysterious cowled wizards of black metal blasphemy hailing from the nearby forest of Toronto.